CEBU CITY—A powerful earthquake on Tuesday morning took Central Visayas by surprise, forcing residents to stay off the streets and businesses to close shop as a series of aftershocks continued to shake the city till evening. The epicenter of the 7.2-magnitude temblor struck Carmen in Bohol, at 8:12 a.m. causing massive damage to property and death to 32 people in the popular tourist island. In Cebu, 15 were reported dead, with five in this city. It is said to be the biggest earthquake to hit the area in four centuries. The famous Chocolate Hills are found in Carmen, Bohol. The two provinces have been placed under a state of calamity. President Benigno Aquino III is scheduled to visit the earthquake-ravaged areas on Wednesday. The Philippine Institute of Volcanology and Seismology recorded aftershocks with magnitudes ranging from 2.7 to 4.8. The earthquake caused extensive damage to roads and bridges, historic churches, government offices, markets and other structures in the two provinces, including the privately run Cebu Doctors Hospital and the Basilica Del Sto. Niño, the oldest religious relic in the Philippines. The bell tower of 16th-century basilica in downtown Cebu collapsed just as a priest was delivering the homily. "People started to move out and the last person who went out was the priest celebrating the mass," Father Jonas Mejares, the church rector, said. Mejares said he has never experienced an earthquake of strong magnitude. He recalls the church's walls have been renovated after two minor earthquakes in the past, none of which were as strong and destructive as the one on Tuesday. The church will be closed until the extent of the damage has been assessed. Meanwhile, masses will be held outside the church, in the pilgrims' center. A mass was held at dusk, drawing hundreds of churchgoers to the plaza. "We love the basilica because our grandparents went to mass there. It's known everywhere from Visayas to Luzon. We love the Sto. Nino, in particular the church. It's a bit sad it happened. 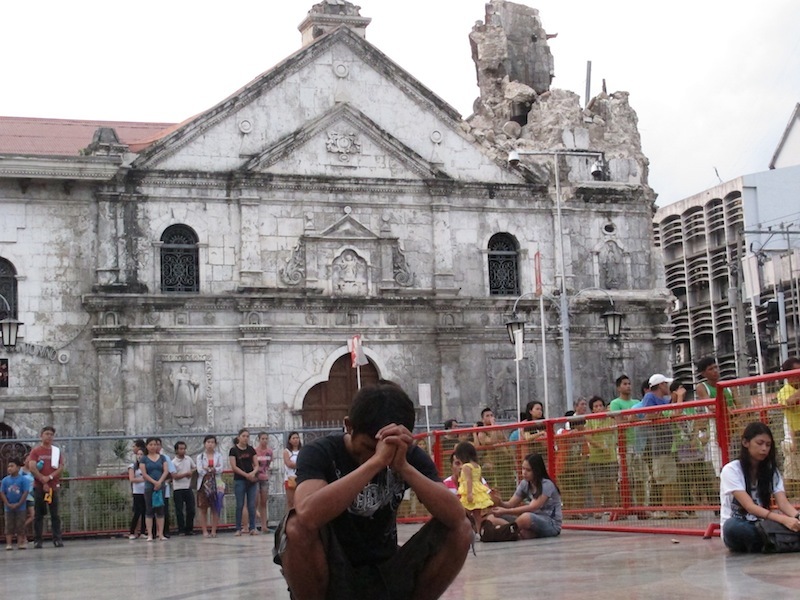 The church is still there but it's no longer perfect," said church devotee Laurence Arbol. The statue of the Sto. Nino de Cebu or the Child Jesus given by Portuguese explorer Ferdinand Magellan to the wife of Rajah Humabon in 1521 at her baptism is housed in the basilica. More damage was seen at the Pasil Seafood Market, also in downtown Cebu and one of the largest seafood markets in the Visayas, where five people were killed and seven injured, police Senior Inspector Chuck Barandog said. Lucino Calvo, officer in charge of the market, said people started screaming and rushing out of the market as concrete beams of the roof fell. A rescue team consisting of more than 50 men arrived immediately at the scene. Three of the casualties have so far been identified: Leona Gabarubias, Randylino Bondoc and Conrado Perez. The injured were rushed to the Cebu City Medical Center. The market has more than 120 stall owners who sell seafood starting at midnight. The vendors will be transferred to an area near the fish port after the two buildings of the fish market were declared unsafe. The market generates a total income of P14,000 a day, said Calvo. Cebu City Vice Mayor Edgar Labella said in an earlier radio interview the city is "quite fortunate" because of the Muslim holiday Eidl’ Adha, as not too many people were in schools and in office buildings. All shopping malls in Cebu have been shut down, along with some restaurants and shops. Hotels are closely under watch and guests are advised to stay on alert in case of aftershocks. The Cebu Parklane Hotel in the city, for example, had to let its guests wait for hours before checking in this morning. The hotel management said each room had to be checked for cracks to ensure safety. The 300-bed capacity government Cebu City Medical Center was forced to evacuate patients. The adults were temporarily moved to tents and the babies to a covered basketball court. Earlier in the day, the local media reported that several buildings have been evacuated, including business process outsourcing (BPO) companies. They resumed operations hours after. Cebu has more than 70,000 working for BPOs. The Legislative Building of the Cebu Provincial Capitol was also badly hit, leaving the office of Vice Gov. Agnes Magpale on the fourth floor with the most damage. The six-story building was built in 2004. Floors and walls cracked open and the roof in at least three offices crashed down. City engineers are still checking the extent of the damage as most of the offices were locked due to the holiday. The 70-year-old Magpale was named acting governor in December last year when then Gov. and now Cebu Rep. Gwendolyn Garcia was suspended for six months by the interior department. When Garcia refused to vacate the governor's office at the Capitol, Magpale was forced to run the provincial government from her office at the Legislative Building. An entry in the logbook of the Legislative Building showed that the guard on duty ran out of the building at 8:20 a.m. to keep safe. It showed him returning to the building seven minutes later to inspect the first three stories where he noted "lights, tiles, flooring, window damaged." But he didn't proceed to the upper floors when aftershocks shook the city. The provincial administrator arrived at the building at 10:47 a.m. to check Magpale's office, while personnel from the disaster management office arrived at 12:42 p.m., according to the logbook. The One City Link terminal for trips to the south part of Cebu was also shut down because of the heavy metal railings that crashed down on four taxis parked by the building. No one was injured but the terminal had to suspend its operations as the tin roof and walls of the building were also damaged. Cebu Pacific suspended flights to and from Cebu while Philippine Airlines flights were delayed.